A string of wells have been drilled along the country’s maritime border to Russia. But none of them meet expectations. The oil industry rejoiced when Norway and Russia in 2010 agreed about the delimitation of the Barents Sea. The waters that for 40 years had been disputed ground were believed to hide a major hydrocarbon potential. Both countries soon started seismic mapping of the area and leader of the Norwegian Petroleum Directorate Bente Nyland quickly made clear that preliminarily results «gave her stars in the eyes». Nine years later, there is little cheering among the Norwegian oilmen that are engaged in well drilling in the borderland. On Tuesday, the country’s Petroleum Directorate announced that also the latest well in the area, the Gjøkåsen Deep, was dry. The well that is part of license area 857 was drilled by rig «West Hercules» and is operated by oil company Equinor. It is the second well drilled in the area. In February, the license holders made clear that a first well was dry. The Gjøkåsen area is located about 175 km north of Vardø, the north Norwegian town, and only 55 km from the border to Russia. Water depths in the area are 293 meter. It is one of the easternmost license areas on the Norwegian continental shelf. The PL857 license area is operated by Equinor (40%). Partners are Lundin Norway, Aker BP and Petoro each with a 20 percent working interest. The Gjøkåsen area has been a disappointment for Equinor and its partners. But the eyes of the oilmen now turn towards even further north. Next up for drilling is the Korpfjell area located as far north as the 74th parallel. 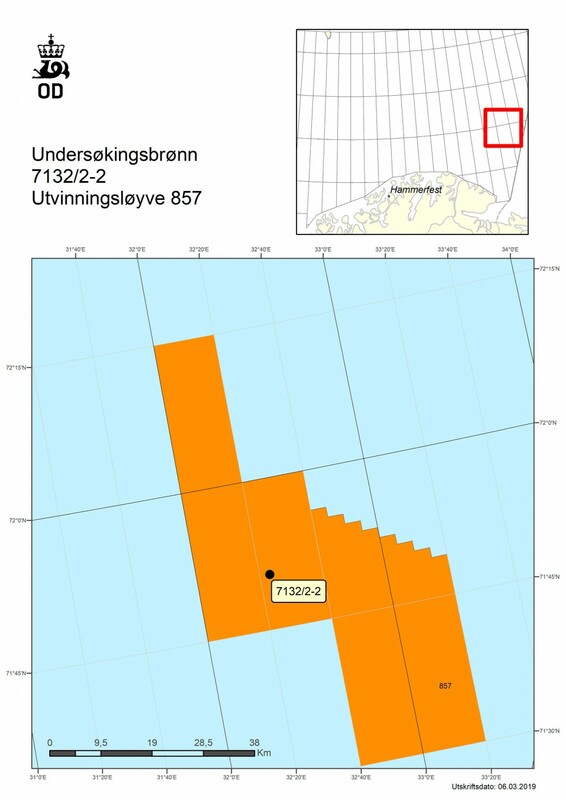 The Petroleum Directorate confirms that the rig «West Hercules» now proceeds to license area PL859, the «Korpfjell», where it will drill exploration well 7335/3-1. The well located about 420 km north of the Norwegian Barents Sea coast and only few kilometers from the borderline to Russia. Major expectations have been connected also to this area. Several experts previously argued that this area could hold a so-called «elephant», a major discovery. The PL859 is among the northernmost licenses ever awarded on the Norwegian shelf. It is located on the 74th parallel and was obtained by Statoil and partners in 2016 as part of the 23rd License Round. Equinor is the operator with 30 percent and the remaining partners are DNO Norge with 20 percent, Petoro with 20 percent and ConocoPhilips with 15 percent. «We are very happy that we can start testing such a major structure», Equinor Executive Vice President Tim Dodson told newspaper Dagens Næringsliv ahead of a first drilling in 2018. That well, however, turned out to hold only a minor gas discovery.